Characteristics of Old Kingdom Pyramids, Sphinx, Thinite Temples. Old Kingdom of Ancient Egypt. religious art from Ancient Egypt. Egyptian architecture has two main characteristics: massiveness and a conservatism that existed for over 3,000 years. Massiveness is best seen in the pyramids and temples, conservatism in motifs such as the pharaoh smiting his enemies that first appears about 3000 BCE, and is still a standard representation for Roman emperors in the guise of pharaohs in the 2nd century CE. The main factors governing Egyptian art and architecture were a state religion and the geographical confines of the Nile Valley. The continuity of religious practice, maintained by a powerful priesthood, gave rise to a conservatism that verges on the mechanical. Even so, Egypt's Old Kingdom (c.2686-2181) was one of the most dynamic periods in the evolution of Egyptian culture. During this period, artists created the images and forms that endured for centuries, if not millennia. Egyptian architects and stone masons mastered the techniques and craftsmanship necessary to erect monumental structures in stone, like the Egyptian Pyramids, using only simple post and lintel methods. Meanwhile, sculptors provided the stone sculpture required to decorate the interiors and the monumental statues for the temple gateways and other, outside areas. The first known stone building in the world was the Step Pyramid at Saqqara, rising to a height of 204 feet in six steps. It was built for the pharaoh Djoser in the 3rd dynasty, about 2630 BCE, by Imhotep, his chief architect. Previously, buildings were of mud-brick and wood (with the rare use of stone blocks as a door threshold). At Saqqara, Imhotep translated the traditional building styles and materials into a new medium, stone, using small blocks but retaining all the earlier building characteristics. The Step Pyramid stood within a sacred enclosure with various ritual buildings nearby. These were all dummy buildings, merely facades backed by rubble with shallow doorways entering only a foot or two. None of their columns were free-standing; they were keyed into adjacent walls; the builders were unsure of the new building material's stability. Fluted columns used there precede their Greek counterparts by about 2,000 years. (See also: Greek Art.) From this first beginning of a stepped pyramid it was a natural development to fill in the steps and obtain a proper pyramid shape. The pyramid, the burial place of the Pharaoh, also represents the sun's rays as they strike the earth, an important symbol of the sun-cult of Heliopolis. The Old Kingdom witnessed the construction of most of the monumental pyramids, including: the Great Pyramid of Khufu/Cheops (one of the traditional Seven Wonders of the World), about 2550 BCE; and the smaller pyramid of Menkaure, about 2530 BCE. 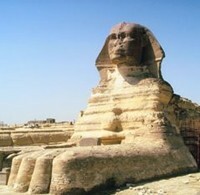 It also saw the building of the Great Sphinx at Giza (c.2450 BCE). As far as temples were concerned, the earliest examples were simple structures of mud, reeds and palm leaves, no traces of which remain. Stone temples first appear in the 4th dynasty associated with the Pharaoh's pyramid: these were mortuary temples connected with the funerary cult of the dead pharaoh. For a comparison with other building designs, see: Greek Architecture (900-27 BCE). Egyptian architecture did not develop from homogeneous principles and traditions. Upper and Lower Egypt remained geographically and culturally distinct, even when joined politically in the Kingdom of the Two Lands. They had different peoples with their own customs, characteristic dwellings, and modes of burial, with different ideas about the divine powers and about the kind of life that followed death. In both regions the cultivation and storage of crops had long been the basis of existence. Settled farmers tend to build permanent dwellings with provision for their grain, cattle, and tools, but in Upper Egypt the farmers shared the land with a nomadic people who had migrated to the Nile Valley from the increasingly arid steppes. Hunters and herdsmen, roaming to find well-stocked hunting grounds and fresh pastures, have always built dwellings that are easily erected and taken down wherever they choose to camp; thus these lived in lightweight tentlike structures with roofs and walls of skins or matting stretched over a rigid frame. See also: Mesopotamian Art (c.4500-539 BCE). Each region also had its own distinctive burial practices. The inhabitants of Upper Egypt, to the south, buried their dead away from the settlements, in the dry sand at the edge of the nearby desert, and formed a mound or tumulus over the grave. The deceased had to be provided with everything they might need - weapons, adornments, food and drink - for their continued separate existence. But in the north, in Lower Egypt, which was flat and wet, the dead received the protection of the villages on higher ground, and were buried under the floor of the houses; thus they remained within the sphere of the living. Each of these modes of burial presented a different conception of the nature of the afterlife and of the necessary ritual provisions for a continued existence. Even in Predynastic times the typical settler lived in a rectangular one-room peasant hut of sun-dried Nile mud. A model of such a hut, found in a tomb, plainly shows the inward sloping walls, the door, and the tiny window openings set high for ventilation more than to let in light. The roof has not survived, but it was flat and may originally have consisted of palm trunks laid side by side: this type of roof was sculpturally reproduced on the ceilings of later stone-built tombs. The slope of the walls later became a characteristic feature of monumental stone architecture: tombs, temples, gate towers (pylons) (see Architecture Glossary), and enclosure walls. It goes back to the early architectural experience with primitive mud-walled structures. From the very beginning, the inhabitants of the Nile Valley and the Delta had made shelters and huts from reeds and rushes. Reeds and papyrus stems, tied or woven together to form walls and bundled together to form light supports for the roofing, are the oldest building materials in Egypt. Ancient hieroglyphs represent various types of huts in simplified outline. These huts made of perishable material, together with the primitive mud houses, served as prototypes for the later monumental architecture. In hieroglyphic writing the two "royal sanctuaries" of Upper and Lower Egypt are distinguished by huts of two kinds. A hut with a semicircular roof, above which two corner posts appear to project, must be interpreted as a structure consisting of bundled reeds and matting on the basis of its green or yellow colour in the writing. In the oldest representations this hut form also denotes the holy places of Buto, the capital of a prehistoric Delta kingdom; in the writing, the "royal sanctuary of Lower Egypt." Translated into three dimensions, this type of hut reveals its basic structure: a building with a roof vaulted longitudinally, between elevated transverse walls. The reed hut of Lower Egypt corresponded to the Upper Egyptian tent of the nomad chieftain, a frame building designed to resemble an animal, with horns projecting from the front and sometimes a fence around the main entrance; at the back hung down an animal tail. The imprints of ancient cylinder seals have transmitted this aboriginal building type; in the developed hieroglyphic writing the animal features have been toned down. The nomad chieftains, who first brought the two kingdoms under their own rule and created the united Egyptian state, had long been settled in the Nile Valley but continued to live in tents, stretching coloured matting over the structural skeletons. After Memphis was founded as the permanent residence of the kings of Upper and Lower Egypt, the palace of reed matting remained a model for the palace of the king as ruler of Upper Egypt and for the shrines of Upper Egyptian gods; but it was now constructed - like the reed hut, its Lower Egyptian equivalent - of solid brick and timber. Both of these building types testified to their particular origins and significance within the new political order, and accordingly their characteristic structural features had to be strictly preserved in the more permanent monumental form. Another building type known from hieroglyphs was also composed of vegetable material. The tall rectangular front of this hut was of matting construction with the corners and eaves stiffened and reinforced with bundles of plant stems bound together. The concave cornice, highly stylized, probably represents the free ends of the rushes that tied the upper edges of the matting walls to the top stiffener. As a hieroglyph this hut means "hut of the god," and in monumental architecture it is perpetuated in the exterior design of a chapel held together with round fillets and crowned by a concave cornice. In the older writing it also appears in another special form, namely, a hut beneath an awning supported on wooden posts. In monumental architecture this form became the prototype of the later "baldachin temple," erected for the celebration of special rites and as a "way station" or resting-place for the images of the gods and their sacred barge during the processions through the precincts of large temple complexes. The "birth houses" of the late temples were also modelled after the hut shaded by an awning. Menes, who unified Upper and Lower Egypt, built his residence in Lower Egypt on the site where later the capital city of Memphis was erected. The name of the palace, "white walls," suggests a brick enclosure, and within it were the residences of the king, the shrines of the gods, and the government buildings of the Two Lands, all these in the styles of Upper and Lower Egypt, respectively. Walls reinforced with projecting buttresses were characteristic of the conquered Lower Egyptian cities, as seen in representations of the triumphs of Menes (Narmer), this Lower Egyptian tradition being adopted by the conqueror from Upper Egypt for his stronghold in the Delta. In the combination of the two different building forms - the tent palace of the Upper Egyptian king and the niched enclosure wall of his Lower Egyptian residence - is an artistic translation of the "Horus name" that thenceforth constitutes the first part of the royal title for the united Egypt: within an upright rectangle is enclosed an artfully composed facade with two gates, the whole surmounted by the ruler as the Horus-hawk. Preserved painted representations of decorative matting and wood framing on the projecting and recessed faces of these articulated walls have been taken as evidence that their niche-modelled surface was derived from wood construction - and from Mesopotamia, where contemporary finds include similar buildings depicted on cylinder seals. However, subsequent monuments make it clear that the wall articulated with niches belongs to a quite different mode of construction from the matting stretched over a wood frame; both were purely Egyptian in origin and, heraldically merged in the "palace name," came together in the Memphis residence. A better idea of what Upper and Lower Egypt contributed to the building forms in and around the royal residence can be obtained from the tombs that were built by the unifiers of the country and their successors, especially the limestone tomb precinct of King Zoser. The unification of Upper and Lower Egypt stimulated the development of a true architecture with quite new tasks, and foremost among these was the building of monumental tombs for the kings of the unified country. Toward the end of the Predynastic period the wood frame for molded mud brick was invented, which was a technical step forward. The form of tomb structures grows from the dual nature of the Egyptian kings as "rulers of Upper and Lower Egypt"; this required two separate burials, one in each half of the country. The prehistoric burial customs that had evolved - cemetery burial in a tumulus grave in Upper Egypt and house burial in Lower Egypt - were incorporated into the architecture of the royal tomb complexes. In Memphis the Lower Egyptian idea of house burial led logically to the tomb being designed and equipped as a "residence"; in the Upper Egyptian cemetery at Abydos, on the other hand, the grave mounds were merely enlarged and developed into abstract geometric shapes. The cult arrangements within each mode of burial led also to particular formations. At Abydos the subterranean burial chambers of the royal tumuli were walled with brick, the floors and walls faced with imported softwoods, and the burial pit roofed over with timbers. However it is known that during the First Dynasty one of these tombs was given a floor and walls of granite blocks that herald the transition to a stone architecture. The tumulus, a heap of sand, rose above the timbered roof that covered the tomb chamber and the lateral rooms for grave furniture; it was contained by a brick wall and probably covered by a shallow brick dome. In front of the east side of the tumulus two freestanding name steles were set up to indicate the offering place. The entire precinct was surrounded by a low wall, outside of which the members of the king's family and court were interred. The royal cemetery, which lies in flat desert country about a mile from the Nile Valley, stood under the protection of Khentiamentiu ("Foremost of the Westerners"), a god of the dead who had a temple at the edge of the valley. This was a brick building whose foundations are preserved, the only example of an Early Dynastic temple. It was elongated in plan; on the short side, two outer chambers with offset entrances led into a third room where the shrine for the cult image was built against the rear wall. As the oldest representations show, the shrine was originally a construction of reeds standing free within an enclosure; when translated into brick it became solidly incorporated in the structure of a closed building, and was moved back against the rear wall. The first rulers of the united country and their successors, as kings of Lower Egypt, lie buried on the western desert plateau across from their capital at Memphis; their tombs are of a type adapted from the burial practices of Buto, once the capital of a Lower Egyptian kingdom. These Memphite tombs have imposing mud-brick superstructures whose multi-layered exteriors form a series of buttresses and niches. They demonstrate the Lower Egyptian palace in the characteristic aspect of its articulated enclosure walls. The articulation has now become an aesthetic system: on the projecting and recessed faces are painted colourful carpet patterns that link the idea of the tomb as a "Lower Egyptian residence" with that of the tent palace derived from Upper Egypt, and thus symbolically express for each king the guaranty of the unified kingdom. The "palace tombs" are also surrounded by low walls, and outside these, as at Abydos, the subsidiary graves are ranged. The offering place of the palace tomb was located in front of a niche in the exterior of the east wall. Detached from its structural context, this niche later became incorporated as a "false door" in the royal and private tombs of the Old Kingdom, a Lower Egyptian element symbolically linking the worlds of the living and the dead. In this isolation of its form and function the false door is frequently edged with beading and crowned by a concave molding. It persisted in three-dimensional or in painted form into the later dynasties and even found its way into temples and palaces, occurring wherever a deceased person, a god, or the king was to appear. To revitalize and consolidate the idea of a unified kingdom, King Djoser (also spelt Zoser), the founder of the Third Dynasty, combined the two separate cemeteries and their funerary institutions into a single giant precinct near his capital of Memphis. The sanctuary was surrounded by niched walls of white limestone over thirty feet high; these represented the "white walls" of the residence. At the focal point of the entire precinct stands the 200-foot stepped tomb, combining an exaggerated monumental stone tumulus in the Upper Egyptian tradition (mastaba) with the idea of a gigantic stairway to heaven. It is still possible to distinguish the various stages in the history of this structure - from the original flat mastaba to a small pyramid, then to the final large step pyramid. The king's Lower Egyptian tomb is a massive stone structure attached to the south wall of the sanctuary; its arched cornice and niched facade correspond to the royal tombs of the unifiers at Memphis. In a consistent development of the Lower Egyptian-Memphite concept of the "house tomb," the other buildings within the precinct are patterned after the Memphis residence, including the king's palace, the government buildings of the Two Lands, and the shrines of Upper and Lower Egyptian gods. In the courts of the tomb complex the royal existence in the hereafter was affirmed and perpetually renewed by ritual reenactments of the "jubilee festival" in the presence of the gods. The various building types in King Zoser's burial precinct were shown three-dimensionally in stone in their Upper and Lower Egyptian forms, with architectural elements appropriately painted for their cult requirements. Airy wood-framed structures covered with reed matting in the nomadic manner of Upper Egypt are recognizable by their arched roofs, fluted masts, and the mats stretched between cross battens or rolled up over doorways. The Lower Egyptian chapels reproduce the forms of the ancient hut of bundled and woven reeds; as independent decorative elements, the round fillet and concave upper molding have their origin in the translation of primeval reed forms into stone. Brick buildings are identifiable from the flat roof and interior ceiling construction, which simulates round timbers resting on architraves supported by fluted wooden posts. Wooden door leaves are reproduced in stone in a half-open position. The fluting of the posts as an artistic form probably goes back to the dressing of softwood trunks with the rounded cutting edge of the Egyptian adz. In connection with the roof construction of the tent buildings it should be noted that the fluted masts support on brackets the ribs of the arched roof; these brackets are missing from the posts in brick buildings, and here they take the form of lateral overhanging plant leaves. At the top of the masts are reproduced sawn-off branches in stylized form. The mortises probably served for the insertion of horns, like those on the old tent palaces of the nomad chieftains. Most of the structures within the burial precinct are simply solid sham-buildings that have mere niches or short passageways for cult images or ritual processions. The only ones with interior rooms are the lengthy entrance hall, the "sacristy," and the living quarters of the king which are built onto the north side of the step pyramid. The disposition of the various buildings within the precinct and their interconnection by means of real passages or false doors did not have to correspond exactly with the residential prototype, but were determined by special requirements of the burial rite and the cult of the dead. For example, the triple-aisled hallway through which the funeral procession entered the sacred precinct had assumed the role of "palm grove of Buto"; thus the stone columns are decorated with a fringe of palm fronds. This first stone-built mortuary complex, whose architectural organization and formal design already indicate a high level of accomplishment, has been identified from inscriptions as the work of the king's chief architect Imhotep, who simultaneously served as high priest of Heliopolis. The transition from the Third to the Fourth Dynasty was accompanied by a fundamental change in the planning and design of the royal tombs. The Lower Egyptian or Memphite concept of the tomb was abandoned; no longer was it a residence for the afterlife, nor the funerary precinct a realistic open-air stage setting for ritual performance. Probably under the influence of the myth of the death and resurrection of the god Osiris, the death of the king now became a mythical fate, whose "mysteries" permeated the burial ceremonies and cult practices and established the principal theme of the new royal tomb architecture. Subsequently the cult area was organized in the form of a "processional stage" along an architecturally defined "sacred way" that began at the edge of the desert and ended in the tomb chamber; therefore the rites were performed and the utterances recited in a succession of rooms, passages, courts, gates, and pillars. The impetus for change came from Abydos, in Upper Egypt; there the procession led from the temple of the cemetery god through the flat desert valley to the royal burial ground in the west. The Upper Egyptian character of the new trend is also expressed in the development and exaggeration of the king's tomb into a pyramid. King Zoser's step pyramid had a rectangular plan; the next phase, the square plan of the step pyramid at Medum, came with the accession of the Fourth Dynasty, and after that the increasing abstraction led to the crystalline geometry of the true pyramid. The step pyramid at Medum next took over - again evidence of its origin in the Upper Egyptian tumulus - an offering temple on the east side. This, however, was still a primitive affair, a modest flatroofed building with two parallel antechambers before a small court with two steles. From a "valley temple" at the edge of the desert a walled causeway led up to the pyramid precinct. In the arrangement of this royal burial area at Medum - valley temple, causeway, and offering temple - the future theme and plan of the Memphite pyramid complexes are first stated. The new ideas about divine kingship and the burial rite were most fully realized in the pyramid complexes built during the Fourth Dynasty by Chephren and Cheops at Giza, where these ideas are manifest in the enormous masses and in the use of hard stones, granite and basalt, and alabaster as building materials. Chephren significantly enlarged the valley temple and roofed over the causeway; his offering temple at the foot of the pyramid was preceded by a huge "veneration temple" with a row of statuary shrines as the "sanctuary." An immediate impression of this architecture can now be gained only from the valley temple, a square building with smooth sloping exterior walls. The masonry consists of a core of local limestone faced on both sides with massive slabs of granite. Also of granite are the pillars inside, and the architraves and roof beams, all monoliths. The floors are paved with white alabaster slabs. The funeral procession arrived from the east, from the Nile Valley, first landing on the west bank in front of the valley temple; it split into two groups and entered the narrow antechamber through two portals bordered only by bands of inscriptions; reunited, it passed through a central doorway into the inverted T-shaped hypostyle hall with its square granite pillars. Ranged around the walls were twenty-three statues of Chephren enthroned, which figured in the ceremonies of the "Opening of the mouth." The thin light that found its way through the slit windows in the roof was reflected from the bright alabaster floor. These early monumental interiors are otherwise unadorned, and they achieve their effect exclusively from the interrelated masses, the construction, and the colour and durability of the materials. The procession left the valley temple through a narrow passage and ascended for nearly one-third of a mile the covered causeway to the pyramid temple. The pyramid temple was also completely sealed off from the outside world and shielded from profane eyes by its smooth sloping walls. In its design the two parts stand out plainly, the outer temple and the veneration temple. The spaces of the outer temple occupy the hollow core of the otherwise solid mass of stone; they repeat the arrangement of the valley temple except that here a passageway separates thematically the crossbar from the stem of the T-shaped hall. A court surrounded by granite pillars introduces the veneration temple; there is evidence that the indentations in these pillars contained enthroned images of the king. Beyond and side by side are the five deep shrines that composed the sanctuary proper, directly behind the five bays of the western row of pillars. The offering place of the Abydos type with its two steles probably occupied the space between the rear wall of the veneration temple and the foot of the pyramid. The procession followed a narrow passageway leading from the northwest corner of the pillared court directly into the walled pyramid precinct - bypassing the sanctuary - and continued to the passage on the north side of the pyramid that ended in the tomb chamber. Already under Chephren's predecessor Radedef, the sun cult of Heliopolis had begun to exert an influence on the dogma of divine kingship and life in the hereafter, and the arrangements of the tomb were correspondingly affected. The Lower Egyptian heritage began to assume greater importance. It the mortuary temple of Radedef's tomb complex, north of Giza near Abu Roash, a system of columns with plant motifs replaces the more abstract architecture of pillars. These religious influences are unequivocal in the tombs of the late Fourth Dynasty. The pyramid shape was sometimes abandoned in favor of the "house tomb" form as, for example, in the tomb of Queen Khent-kaw-s in the necropolis of Giza with its "palace" rising above niched walls. With the advent of the Fifth Dynasty sun worship became the state religion. In the choice of their tombs these kings reverted to the classical pyramidal form and adapted the Memphite mortuary temple to the demands of the new cult. The founder of the dynasty, King Weserkaf, shifted the mortuary temple to the south side of his pyramid at Saqqara in order to include the entire path of the sun in a ritual performed within a pillared court. His successors returned to the traditional axial arrangement with the temple on the east side of the pyramid; the stern blankness of the temple exteriors was relaxed, however, and colonnades were introduced to open up the valley temple, and sometimes the veneration temple, to the outside world. Columns in the form of palm trees and bundles of papyrus and lotus stalks supported the roofs of the porticoes; these ultimately derive from the early reed architecture, in which bundled plants were used as structural supports, and in their stone form they stand for the sun god, the divine myths, and the burial practices of Buto. On the axis of the sanctuary, at the base of the pyramid, another cult edifice with a vaulted ceiling was introduced; its false door, a Lower Egyptian element, displaced the Upper Egyptian offering place with steles that had originated at Abydos. The decoration of the interior gives "cosmic" significance to the chambers of the Fifth Dynasty temples. Ceilings are painted blue with golden stars to represent the night sky; floors of black basalt represent the dark earth from which sprout plants in the form of columns. The creative development of monumental tomb architecture came to an end with the close of the Fifth Dynasty. The mortuary temples of the kings of the Sixth Dynasty adhere strictly to the established plan and return to the closed structure and abstract pillars of an earlier period. This change in the architectural organization and design of the royal tomb complexes of the Old Kingdom is not to be understood as a "stylistic mutation." Each complex shows individual planning. Upper and Lower Egyptian influences are interwoven as principal themes; in the course of development the relationships among chambers, halls, and passages are dissolved and the elements reshuffled. The architectural historian must take these complexes "apart again at the joints" and explain them as changes in "thematic functions." These functions are recognizable in the Pyramid Texts that first appear on the walls of the passages and tomb chambers in the pyramids from the late Fifth Dynasty. In their arrangement, progressing from the entrance to the heart of the pyramid, they correspond to the successive features of the valley temple, causeway, and pyramid temple. Thus the architectural development of the pyramid complexes becomes a sublime manifestation of continually changing rites and eschatological beliefs, and in these one can discern the spiritual tensions of the epoch and the clashes of contending principles and forces. Of the Old Kingdom sanctuaries of the gods at Memphis, nothing has survived. The only sanctuary of that period still standing is the temple of Qasr el Sagha, north of the Fayum basin. On the basis of its construction of massive limestone blocks it probably belongs to the Fourth Dynasty; its plan is scarcely distinguishable from that of the sanctuaries of the pyramid temples. The seven shrines of the gods once worshipped here stand side by side on a raised platform. Each shrine concealed a cult image behind doors that could be opened and closed, and is bordered by a molding and crowned by a concave cornice. The row of shrines opens on a narrow passage bounded on the other side by the thick front wall of the building. In the middle of this wall, opposite the large central shrine of the principal deity, is the entrance to the temple. Small rooms on the two short sides of the sanctuary probably served for storing ritual accessories. No inscription reveals the names of the gods to whom this temple was dedicated. See also: Egyptian Sculpture. It is possible that in the Old Kingdom the national gods had their shrines in the imposing mortuary temples of the kings and were included in an established cult. The growing influence of the sun god has already been mentioned, and the sun sanctuaries closely connected with the royal tombs are, in the area of the capital, the only temples of which enough is preserved for a plausible reconstruction. For these temples, too, in which the day star was worshipped, there was no established architectural composition; it was determined by the evolving theological system of the sun cult. Just north of Chephren's valley temple at Giza lie the remains of a monumental temple on the axis of the Great Sphinx immediately to the west. This temple of the Sphinx was dedicated to Harmakhis, or "Horus at the horizon," according to a New Kingdom inscription. The massive structure with sloping walls and concave cornices is accurately aligned with the four points of the compass. The outer and inner walls and the pillars of the inner court are faced with granite blocks, the smaller pillars and roof beams surrounding the court are granite monoliths. As in Chephren's valley temple, two entrances from the east lead into the building, emerging in the north and south pillared halls of the court, which is narrow and on a precise north-south axis. In front of the broad pillars surrounding the court extant remains indicate that seated figures of Chephren were placed there. The design of this unique building showed on the long east and west sides of the court a several-stepped niche, provided in each case with a row of six pillars and, nearer, a row of two. The ambulatories on the short north and south sides, in a modification of the original plan, were widened by another row of six pillars each. The niche in the west wall is aligned with the Sphinx behind it, which as "Horus at the horizon" equates the dead king with the evening sun; the eastern niche indicates due east, toward Horus reappearing as the morning sun. The twenty-four pillars in the four ambulatories constitute an allusion to the sun's daily journey. The two pairs of pillars in the niches probably represent the four pillars of the sky. The Harmakhis temple is therefore a monument and holy place of the sun god in the person of Horus, with whose disappearance in the evening the king was identified in the Sphinx and upon whose cyclical return every morning the king based his hopes of continued existence through eternity. On the rim of the western desert, just north of their pyramids at Abu Sir, the kings of the Fifth Dynasty built sun sanctuaries of which two have so far been cleared. They were "monuments of the living king to his father Ra," and, after the death of their builders, probably served for the worship of that god, source of the perpetual renewal of both nature and the kingdom. As an architectural type, these temples constitute a special form that would seem to go back to the sanctuary of the sun god Ra in Heliopolis; the original model was probably a "primeval hill" with a monumental pillar, the benben stone. The first of these sanctuaries of the sun, built by the founder of the Fifth Dynasty, King Weserkaf, was made of brick; King Ne-user-ra built his of limestone. It had an obelisk about 120 feet tall, constructed of white limestone blocks, and this stood on a sixty-foot-high granite-faced base with sloping walls on the west side of the court. The walled court was surrounded inside by a walled corridor. From the entrance on the east the portico ran along the south wall to the base of the obelisk, and from there interior ramps led to an upper platform in front of the east side of the base. In the court, in front of the obelisk base, open-air sacrifices were offered on a big altar built of massive alabaster blocks; north of the altar was an area where the sacrificial animals were slaughtered. Outside the sanctuary, to the south, are the brick foundations for a solar boat. The situation of the sun sanctuaries on the desert plateau made it necessary to build a valley temple with a causeway leading to the high ground, like those associated with the royal tombs. The hieroglyphs for the names of the individual sun sanctuaries of the earlier Fifth Dynasty show only the base, whereas the later ones include an obelisk as well. In the Old Kingdom the obelisk is relatively thick in shape; in the Middle Kingdom and particularly in the beginning of the New Kingdom it became more slender and was made a feature of the architecture, generally paired in front of the pylons of the temple. It is derived from the Heliopolitan monumental pillar, the benben stone, the resting place of the sun. In the Old Kingdom, under the influence of the same abstracting tendencies that led to the true pyramid, it acquired the geometrical shape of a square tapering pillar with a pyramidal apex. Today of the Heliopolitan sanctuary only the sixty-five foot granite obelisk of Sesostris I still stands. However, we shall have occasion to mention Heliopolis again in connection with the planning of the temple of Amon-Ra at Karnak during the New Kingdom and, above all, the temple complexes at Amarna of the sun worshipper Akhenaten. Just as the smaller graves of the courtiers were disposed around royal tombs in the cemeteries of the unifiers of Upper and Lower Egypt and their successors, at Memphis and Abydos, so in the later epochs the high state officials were buried near the tombs of their masters. In the Old Kingdom these dignitaries were typically buried in mastabas, monumental tumulus tombs with sloping exterior walls, first built of brick but before long of squared limestone blocks. In the interior of this mass were first created - starting with the "door niche" as the offering place (false door) - narrow cult places, which were gradually widened into cult chambers; by the end of the development, in the tombs of the viziers of the Sixth Dynasty, these took over the entire core of the mastaba. During the Old Kingdom the offering place with the false door underwent many changes. The mastaba was also influenced by domestic architecture, as exemplified by the narrow pillared halls at the entrance or around the courts that preceded the tomb. Certain elements, such as the statuary shrines for the statue cult, were clearly borrowed from the royal tombs. In its spatial planning the mastaba has an evolution parallel to that of the royal mortuary temple during the Fifth and Sixth Dynasties; the plan was continually being revised and adapted to conform to changes in the requirements of the cult. For details of Third Millennium burial chambers from northern Europe, see: Newgrange Megalithic Tomb (c.3000 BCE) and its sister site Knowth Megalithic Tomb (c.2500 BCE). Tomb-building practices outside the capital, in the nomes of Middle and Upper Egypt, had a decisive effect on the course of Egyptian monumental architecture. They were controlled by the local governors or nomarchs, a feudal nobility, who, starting as mere servants of the king, had become increasingly independent with the weakening of centralized power. In Middle and Upper Egypt the boundary between desert and fertile land is often marked by sharply rising ground; sometimes steep cliffs actually form the bank of the river, and the provincial tombs are mostly carved out of the living rock high up the cliff face. Their cult chambers and furnishings were patterned after the prototypes at the royal capital. The sequence of a forecourt in front of the rock-hewn tomb facade, a screened entrance hall supported by pillars, and a causeway was dictated by the physical nature of the site; in the provinces the burial arrangements may show many variations. At Thebes, loose sediments form low hills between the rivers and the western cliffs. Here, as part of the tomb complexes of the local princes, huge courts could be excavated on a east-west axis: before the narrow west end of the court an open hall of stout pillars was carved out of the poor rock nearby; from the centre aisle of this hall a level passage was tunneled westward to a cult chamber; the shaft went from here to the sarcophagus chamber. The retinue of the Theban prince was buried in separate graves in the side walls of the court. We gratefully acknowledge the use of material from the fascinating book Ancient Architecture (published by Electra, Milan, 1972): an essential work for all students of the architecture of Ancient Egypt, not least because of its sensational photography of the interiors of famous pyramids and temples.  For more about the design of ancient architecture, see: Homepage.